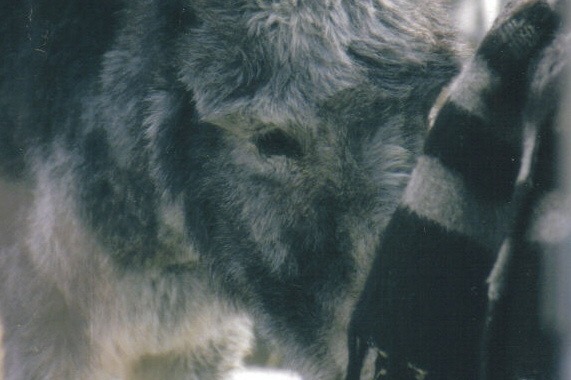 The majority of our burros were already elders when rescued from being shot by the national park rangers at Death Valley National Park in 2000. Now, 15 years later, they are all approaching 35-40 years old. Other rescued burros have lived as BLM adotped burros till their lives changed for whatever reasons and then came here for sanctuary. Many have been abused as roping burros for rodeo practice. These burros are unadoptable so they need the Wild Burro Rescue sanctuary to live out the remainder of their lives well cared for in a loving environment where they are treated with the kindness and respect they deserve. Many like Chyrstal, Sundown, Billy and Poppy (pictured here) can no longer eat hay so they depend 100% on equine senior, oats and supplements to survive. They are removed from the larger groups and given a corral and shelter of their own where their extra special diet can be provided, To watch then come back from the brink of death to health is a wonderful reward for those of us who care for them. We can only do this with your help. Although we are not a horse rescue, some cases cannot be ignored if we are to sleep at night and live with ourselves if we do not provide care and sanctuary in a life and death situation to ANY elder equine in crisis. Many horses and mules come to us in a sad and desperate state of starvation. Hay alone cannot bring them back. This special diet is a lifetime need that gives them a high quality life for many more years of happiness and love. please help us make their golden years truly golden. Special care and shelters make this a reality. We receive NO government funding, have no paid staff, we are all volunteers. The burros depend on people like you for their future. Below is our monthly budget. Your help in any capacity is greatly appreciated! Please help us reach our monthly goal by a regular contribution for over-all expenses or in specific categories of your choosing. 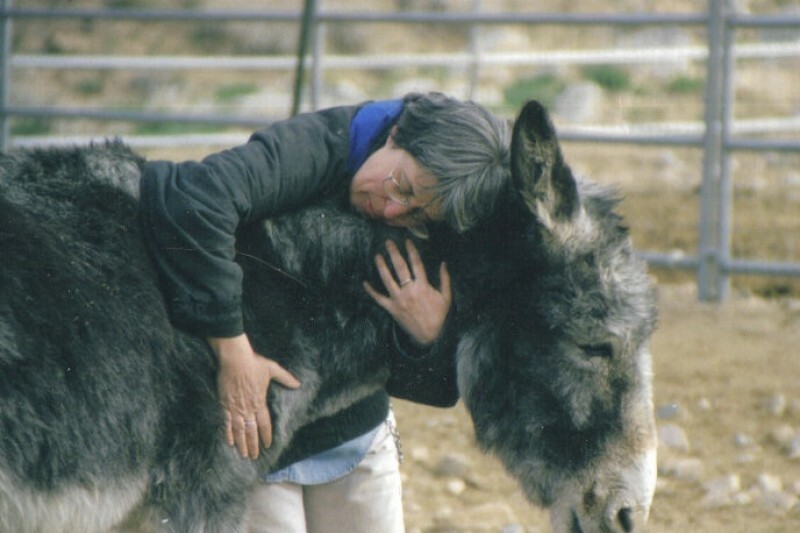 Thank you from all of us here at the sanctuary and especially from our elder burros! Once again we need your help! I have just gotten off the phone with Diana and she asked me to put out another plea for help with our hay supply for our burros. With the rains and snows that have hit our area so hard these past weeks, we have been going through twice the amount of hay that we normally feed our burros. They need these extra feedings to help them stay warm on these bitter cold days/nights. Naturally, our hay bill has doubled too. We are spending close to $5000 per week on hay alone. This is not counting costs for the Equine Senior feed and the rolled oats we are giving for our senior burros. Are you able to help us? Any donation made is such a big help for us to buy another load of hay and more bags of grain and oats. There is no "small donation"! We rely solely on the generosity of you, our supporters to help us get through these tough times. Remember that your donations are tax deductible! 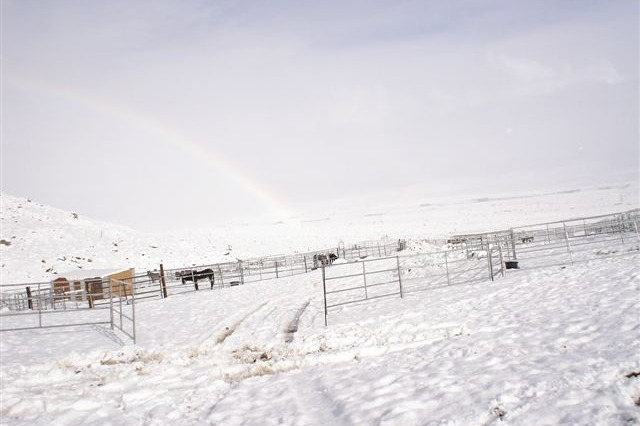 All our burros young and old, mules, horses and Bessie our cow need to stay warm! Can you give us another hand at this? Thank you so much. I was speaking with Diana this morning and she asked me to put out an urgent appeal to all of you, our supporters. These very bitter cold wind chill temperatures that have dropped well below freezing for many nights and days in a row here at the sanctuary located in the Sierra range. The burros need double the amount of food during these cold months and because of that, our supply of hay and grain needs to be replenished ASAP. There is another storm front predicted for this coming week. 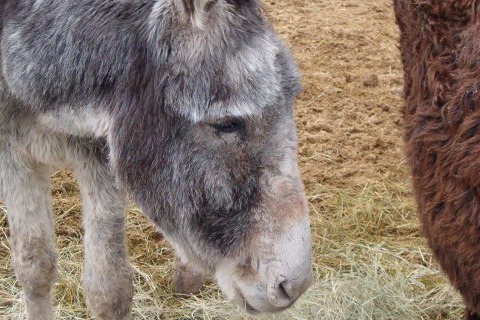 Please give us a helping hand to get more food in for our burros, mules, horses and our cow Bessie. It is costing us approximately $5000.00 per week in these winter months. Yes, PER WEEK to keep the burros well fed. So you can see from that figure that we need your help! Any amount you can send our way would be so much appreciated. Our old timers are especially having a difficult time. Their diet with the Equine Senior and rolled oats is a must for them. So, how about it? Can you help us to get more hay and feed/grain in for our burros? Thank you very much! These are things we can only get through our veterinarian! How about giving us a helping hand to be able to get these items and have them readily available when we need them. We want to reach out to you, our supporters, at a very critical time for us here at the sanctuary. Funds are low until we start to get responses from our fall/winter newsletter that just went to press today. We only have enough hay for 8 days of feeding! A scary situation to be in. We want to ask if you can help by either a direct donation or if you prefer, you can call our supplier directly and order as many bales of hay as you'd like or bags of Equine Senior and Rolled oats for our senior burros. If you choose this last way, you can call Gateway in Inyokern, CA at 760-377-4571 and ask for Heather. Just let her know how many bales/bags you would like to add to the hay truck that delivers directly here to the sanctuary. We need your help! Diana said just this morning: "We are desperate right now and we NEED help to get our hay barn refilled and more grain for our old timers ". So whatever you can do to help out would be very much appreciated. There is no such thing as a small amount ... everything is appreciated. Christmas charities ? This is much needed by these burros who are old and can't help themselves. Help them , please. I agree with Ted! If we say we love burros, then it's time we "put our money where our mouth is". 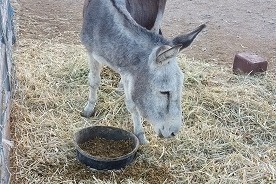 Especially the senior burros; they need a special diet for the rest of their lives. 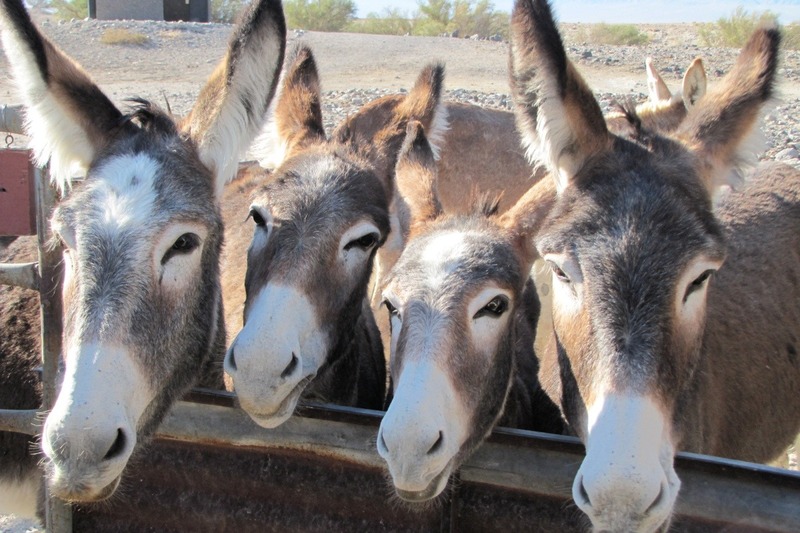 You don't need to be "onsite" at the burro rescue to give a donation -- that's one of the wonders of the Internet, instant results! So please give to help these gentle, beloved animals. Come on friends let's get behind this with our best support. It's tax deductible too!